Assistant A.K.A ASST features several talented creators who believe in carving their own paths in a crowd fashion industry. They are certainly the pioneers, who are next in line to make their unique mark on the fashion world. Buy a single copy or subscription to Assistant magazine. 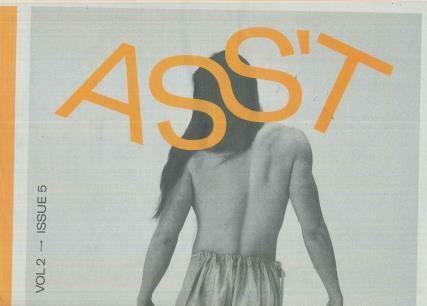 Assistant has recently changed the logo to ASST not just an astatic change but a shift in a new bold direction. The magazine features the soaring highs and deep lows of their combined life experiences. You’ll be taken on the journey detailing the why, when where and how ASST have been able to grow to where they are today. If you’re in need of some new creative fashion waves, then let ASST show you how to express yourself. Each issue pushes the contemporary fashion world to its limits. It’s clear that this is indeed a new generation taking over.